This is to announce the 2017 Call for proposals for the Community Action Research Programme (CARP+) targeted to Egerton University and Gulu University and financed by TAGDev Programme. The CARP program aims to encourage universities to develop and invest in more comprehensive and sustained action research into a particular geographical area or in a selected commodity along the full value chain. The CARP+ is defined by inclusion of the TVET as part of the CARP engagement that has hitherto not been a focus in earlier approved CARP Projects. This CARP+ Call thus seeks to support projects that innovatively enhance university-led action research and impact by engaging and working with technical/ vocational Education and Training (TVET) institutions. All successful proposals must include at least one TVET institution as a partner, and demonstrate how the project will responds to TVET needs. 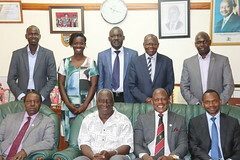 This specific Call seeks to extend university activities to work more closely with rural communities through multi-disciplinary and multi-institutional partnerships involving key stakeholders such as research, extension and development agencies, policy-makers, the private sector and TVET institutions as a must. The Call will support proposals focusing on crops and livestock sector value chains of strategic importance in Kenya and Uganda that provide opportunity for sustainably moving a significant number of smallholder farmers out of poverty and food insecurity. For this initial call ONLY proposals from Gulu University or Egerton University will be eligible. A follow up call to award four additional CARP+ projects will be released in August 2017. The call will be open to all RUFORUM member universities.